Come join the Bozeman Taproom for Oktoberfest on Saturday, September 22, 2018. The Bozeman Taproom will be closing Mendenhall Street, from Rouse to Bozeman so the residents of Bozeman can enjoy an assortment of great Oktoberfest beer, sausage, hot pretzels, music and more. The festivities start at 2pm and beer and music will be flowing until 9pm. There will be a Stein Holding Competition and best Oktoberfest outfits will be awarded. Throw on your Lederhosen or Dirndls and make sure you come with a robust Oktoberfest spirit. This is a family friendly event. Live music will include The Bridger Creek Boys and Milton Minasco and The Big Fiasco. 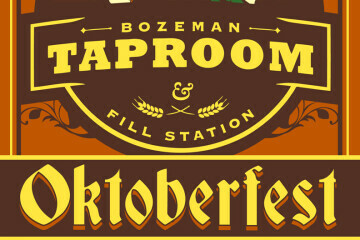 So, come join the Bozeman Taproom Saturday, September 22, 2018 for Bozeman's biggest and best Oktoberfest.